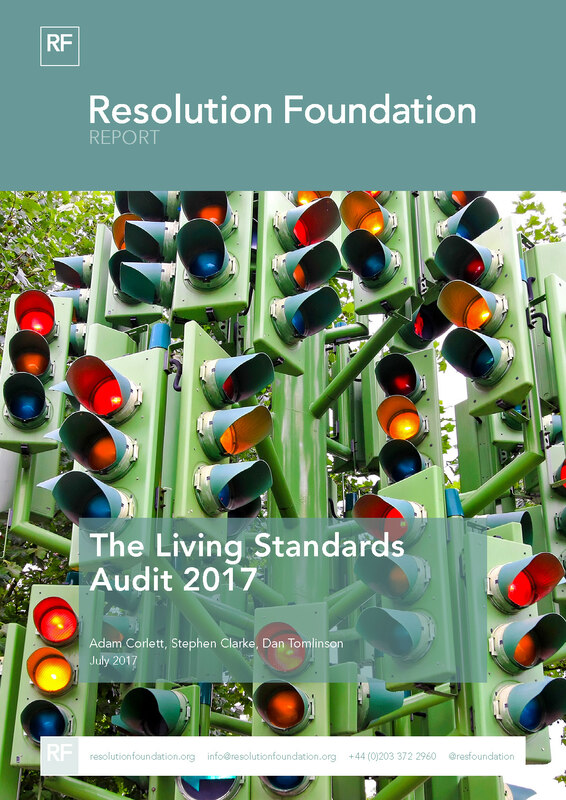 In this report we provide the first comprehensive look at the living standards of UK households in the year leading up to the 2017 general election, as well as a detailed look at the trends in living standards over the previous two decades. The years since the financial crisis have been far from an easy ride for family living standards. Incomes slowed in the years preceding the crisis and fell significantly subsequently. After a brief two-year ‘mini-boom’ between 2013 and 2015 (driven especially by low inflation and strong employment growth) the signs are pointing towards a living standards recovery that is beginning to falter. Our ‘nowcast’, constructed based on timely data for many of the components of household income, suggests that growth in living standards slowed dramatically over 2016-17, falling by half compared to a year earlier. Despite employment reaching record highs, real average earnings are now falling in the UK – in both the public and the private sector – and in addition the real value of many working-age benefits is falling as the benefit freeze interacts with rapidly rising prices. 2016-17 may have been just the beginning of a slowdown in income growth for low to middle income families and a rise in inequality for us all. Growth in typical incomes has slowed significantly, from 1.6 per cent in 2015-16 to 0.7 per cent this year. But, the living standards picture looks to have deteriorated over the course of 2016-17, with timely National Accounts data suggesting that real household incomes per capita have declined in each of the last three quarters. Housing costs have acted to boost income over 2016-17, with typical incomes after housing costs increasing by 1.3 per cent in 2016-17. Owner occupiers have fared particularly well thanks to falling interest rates. Our nowcast suggests that typical incomes among those who own with a mortgage have increased by 1.7 per cent over 2016-17, compared to just 0.2 per cent for private renters. Inequality in the UK is high, and has been rising slowly over recent years. A large part of this story has been fast-rising incomes among the top one per cent. Their total share of income is now nearing a record high. In contrast, typical real incomes after housing costs among low to middle income households are likely still lower today (2016-17) than it in 2003-04. Similarly, the typical income of those aged 24-35 is still no higher than in 2002-03. The UK’s regional disparities have narrowed slightly during the recovery, with annual average growth of 4 per cent since 2012-13 in the North East (which was the UK’s poorest region four years ago). But the longstanding gap between the highest and lowest performing regions remains.